This book explores a fascinating piece of Canadian history, the construction of a navigable waterway though the Canadian wilderness, between Lake Ontario and the Ottawa River, in the middle of the early 19th century. The project faced a host of difficulties including man-made problems such as survey errors, and problems with nature such as unexpected bedrock, vile smelling mud, spring floods, and malaria. This book takes a brief look at how the decision was made to build the canal, and then takes a detailed look at each individual lockstation on the Rideau. Attention is paid to the actual construction of the lockstations, looking at why each spot was chosen, problems that had to be overcome, and how they did it. In most cases the original construction plans had to be changed, it was engineering on the fly. 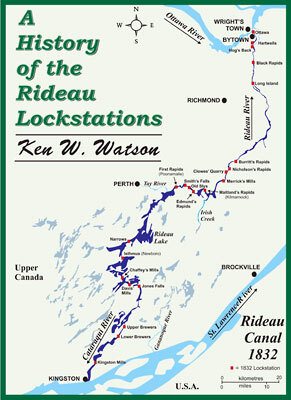 To augment the text, each lockstation section includes a reproduction of a painting of the lockstation, done in the 1830s or 1840s and photos showing the locks today. Maps of what each lockstation looked like when completed in 1832 is also included. Those with an interest in Canadian history will enjoy the book, but it will be of particular interest to those who have an opportunity to visit a Rideau lockstation. The locks are living history, they are working today much as they did when first opened in 1832. With the aid of this book, a visitor to the Rideau Waterway can fully understand and appreciate how and why each lock was built. The book was written by Ken Watson, who since 1996 has run a non-commercial Internet website all about the Rideau Waterway. It has been published by Friends of the Rideau to help bring to the public the interesting details of how these locks were constructed. Friends of the Rideau is a non-profit group dedicated to promoting and enhancing the beautiful Rideau Waterway.